England's favorite pop dreamers awake from a seven-year slumber, giving us more of what made us like them so much in the first place. Greatest hits compilations are no longer considered to be the headstones of a once-active band. 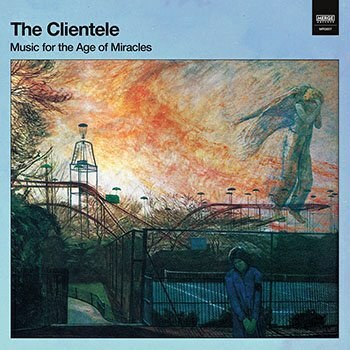 But when English band the Clientele released Unreal & Alone a couple of years back, fans of the critically-acclaimed pop outfit must have been wondering if they were ever going to get back in the saddle again. A solid seven years have passed since the band released any new material and singer Alasdair MacLean appeared to have moved on to a new project with Amor de Días. Strangely enough, it took a little musical interaction between MacLean and someone outside of the Clientele to kick the band back into gear. That someone is Anthony Harmer, a long-time friend of the frontman and expert Santoor performer. MacLean was so impressed by Harmer's control of the Iranian dulcimer that he invited him to embellish on his latest batch of songs. This path eventually turned into a new Clientele project with bassist James Hornsey and drummer Mark Keen stepping back into their old roles. The ostentatiously-named Music for the Age of Miracles is the result. A seven-year absence from the recording studio plus one new member hasn't changed the band's sound a great deal. Alasdair MacLean still sings like he's standing behind two or three microphone filters. Lush ornamentation by either guitar, piano, or keyboards continues to serve as the perfect soundtrack for leaves turning color and falling to the ground. Hornsey and Keen maintain their duties as anchors and not a driving rhythm section. Dynamics, tempo, and dissonance take a backseat to dreamy atmospherics and deceptively easy melodies. Lyrics like "Birds fly in from Africa" or "In the corridor, the face of God is smiling" never feel overly corny or out of place. Nearly every hook MacLean has prepared for you approaches with gentle stealth, securing the music's reputation as a "grower". You could probably get away with saying that Music for the Age of Miracles is pure, classic Clientele. If you hadn't read about Anthony Harmer's involvement, you'd be forgiving for overlooking his contributions entirely; he blends in that well. Of the album's 12 tracks, three are brief instrumental interludes with mythical titles -- "Lyra in April", "Lyra in October", and "North Circular Days". Here and there, the surprises within the songs come in small packages. "Everything You See Tonight Is Different From Itself" (good luck calling out for that one at a gig...) comes riding in on a filtered and slightly distorted drumbeat. It actually sounds like it's going to be a hard left for this band, but in come the trumpets, harps, and vocals alluding to empty faces and empty houses. "The Circus" is the closest that Harmer and the rest of the band get to the Iranian roots of the Santoor. Set to waltz time, the main dulcimer/violin figure certainly doesn't carry the feel of Western music, though the song it drives remains very much a Clientele song. Experimentation is kept to a minimum. This may not suit everyone, but it suits the Clientele in their current place and time just fine. "The Museum of Fog" is an echo of the spoken-word tune "Losing Haringey" from Strange Geometry -- at least I think it is. In this tale, MacLean tells of following a group of "kids" to a show put on by a band he isn't familiar with. As is with his singing voice, MacLean's speaking voice is relatively low in the mix. The story he tells takes on an impressionistic feel by default, making it sound like more of a dream than a true-life anecdote. Perhaps that's all that it is. So many of the Clientele's finest moments come cloaked in a haze that, while not exactly impenetrable, talks you into playing a guessing game while never talking down to you. That makes all the difference with a group like the Clientele and Music for the Age of Miracles puts them right back where they were, where they belonged all along.